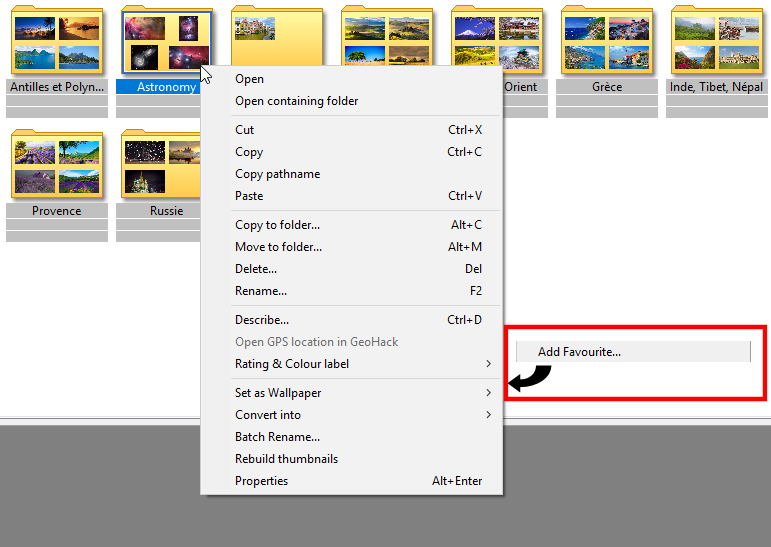 In XnView as well as in XnView MP, when the local menu of a folder is open there isn't any command to add that folder to the favorite folders. It is required to open it previously to be able to add it to the favorite folders by the star which is close to the address bar. Could you add this command to the local menu of the folders so that the operation can be done without having to open them ? Another solution (also missing) would be by dragging & dropping the folder to the "Favorites" panel. But if at least one of these two solutions was available it would be really nice because it wouldn't make loose the focus on the current work in the mind of the user when he is in a repetitive work. you want a direct item in toolbar? It seems that you forgot this request in the new release. Un grand merci, Pierre ! Will you add this feature to XnView Classic too ? Excellent ! Tip top !